My name is Fabiana. I’m 23 yrs. old and pregnant for the first time. My boyfriend and me are now living with his parents in North Bergen. We both work the night shift at Walmart and came straight from work to the abortion center in Englewood with only the money we had in our hands and a lot of regrets. We want children but, did not wish to have one now before getting married. We met Rosie, the Manager of Our Gift of Hope. 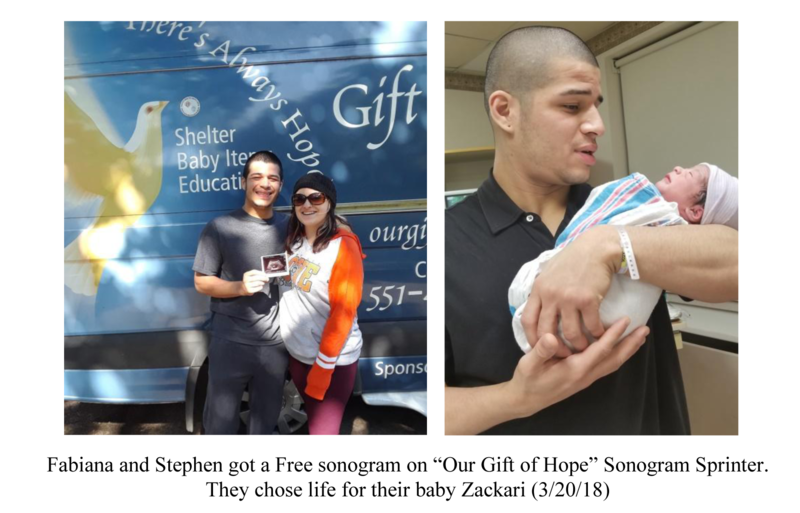 She showed us the Sonogram Sprinter across from the clinic and asked if we would like to sit and talk about keeping our baby and getting the help we need. Rosie said the sonogram was free and we did not have to pay for any services. As I prepared for the exam, I had no idea what we were going to experience when we saw our baby on the screen in real time. As Rosie started scanning my small 9 week embryo up on the screen it started to wiggle around slowly and both of us were shocked to see something so small move around like that. When we heard the heart beating, my boyfriend Stephen started crying and said over and over again – WOW. Rosie stopped the exam and gave Stephen some tissue to wipe away his tears. We welcomed our beautiful baby boy on March 20, 2018. Thank you for saving me and my baby’s life. He is beautiful. I can’t thank you enough!